Who is Being Happy Mom? Since childhood, I was not used to reading novels or inspirational books. The only books I read were academic literature But today, I have realized that reading books is the best hobby that one can have. "Books are the real friends of man." I am trying hard to fit the book reading habit into my daily routine. This is also the one trait which I want my child to develop during his childhood. He should not need to put an extra effort to read books. Thankfully, my 4 year old son has a habit of listening to bedtime stories. He loves listening to stories from his Dad. Sometimes he uses his own unique language to read out a story to us. We thoroughly enjoy the storytime sessions with him. For us, books are another way to keep our kid away from digital life. I literally hate to give the phone, iPad/tablet to my son to engage him. Fortunately, we are successful in maintaining a gadget-free culture for our son. In his first year of birth, we did not read books to him. But as he starts exploring the world, we also started to find good books for him. My son absolutely loves to read books in which illustrations are more than words. He is not able to read by himself, so for him, ‘story’ is defined by the pictures in the books. Hence, graphics are the top criteria for us, when we have to make a choice on the book to purchase. I always look for books which are age-specific and creative in illustrations. It is often said that stories are defined by pictures, not by too much text. A few days back, I received a storybook called “Oh My Name” written by Nikhil Mittal. The most distinctive aspect of this book is that it is a personalized story book. I had never heard of this concept before. When it reached our home, I was more curious to experience the ‘personalized’ book than my son. As the name suggests, this book unfolds the story around your kid’s name. For example, my son name is Ayaan. 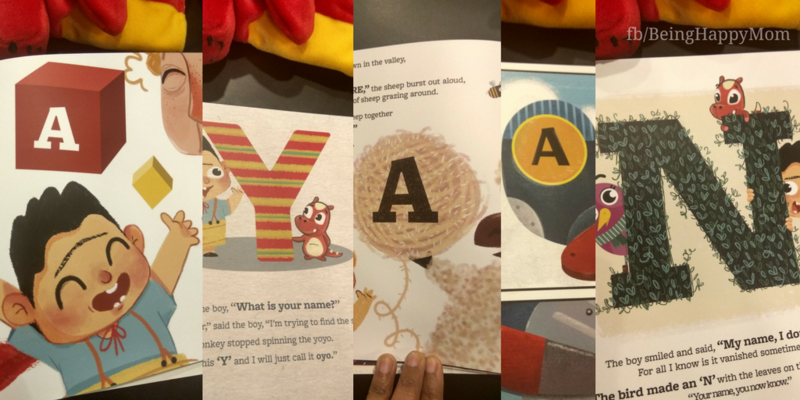 This book has the story around the letters A, Y, A, A, N… It’s a unique style of letting the child know his own name’s letters. 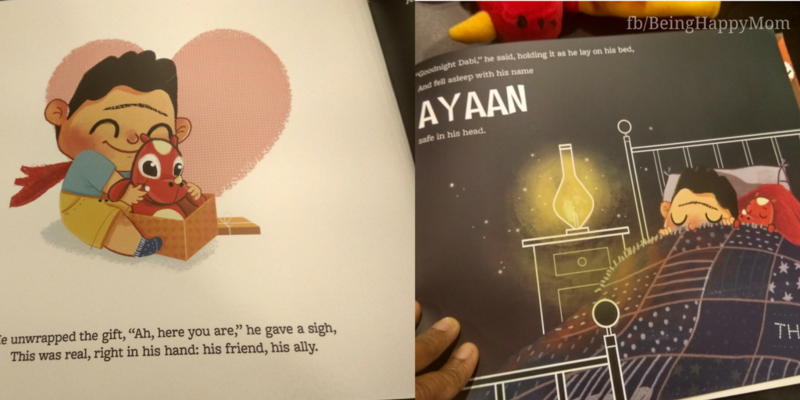 This book has made a beautiful story around the child’s name’s alphabets and the gender of your child. 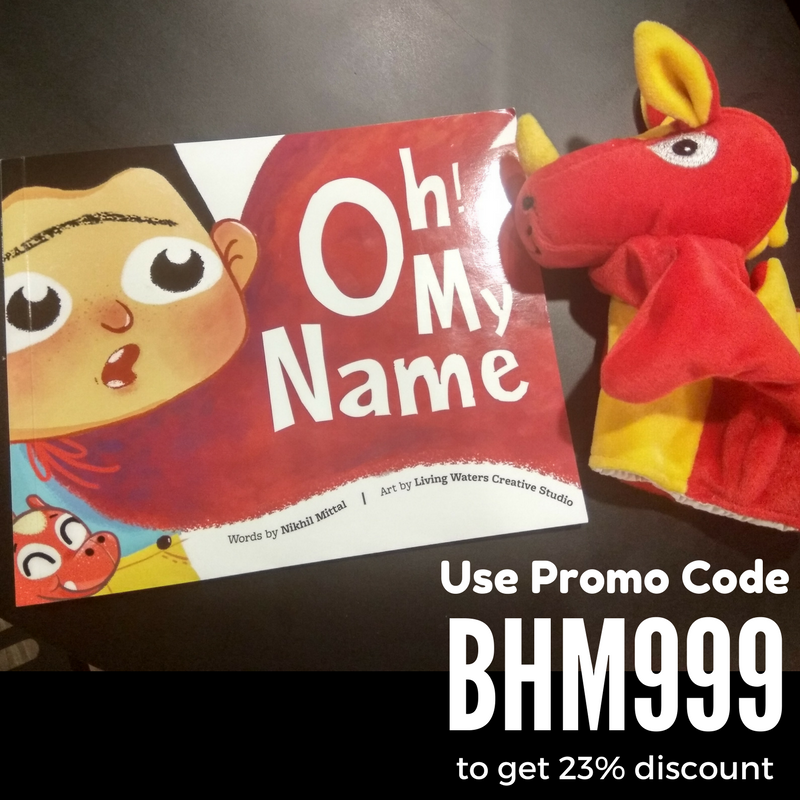 Oh My Name is a personalized children’s picture book, where a child goes on a journey to find his own name along with his friend “Dabi”. Dabi is a puppet character which your child will get as a complimentary gift. During his journey to collect the alphabets of his name, the child comes across different animals, places and people. By the end of the book, your child will be well versed with the letters of his own name and also the name of his new puppet friend “Dabi”. Therefore, the theme of the book is to get your child acquainted with his/her name and the letters of his/her name. Story behind the “Oh My Name” Idea? A father was reading a storybook to his daughter but she was losing interest in between. She closed the book in a hurry. When her father asked her the reason, she replied that she would only read the book which contains her name. That’s where the “Oh My Name” book idea sparked. The father believed that if his own daughter loves a personalized name book then every other child will love it too. Toddler / Pre-Schoolers of age group 2 – 8 Years. The exact price of the book on the website is Rs. 1,299/- but the author has created a special promo code for Being Happy Mom users. Use promo code BHM999 while placing your order to get the 23% discount. I am in love with the illustrations of this book. The language of this book is extremely simple and easy for your child to understand the story. It’s a colorful book for toddlers. Kids are attracted to stuff which is full of bright and beautiful colors. My son was completely hooked to the book till the last page. You can add a personalized message for your child. Paper & print quality is superb. 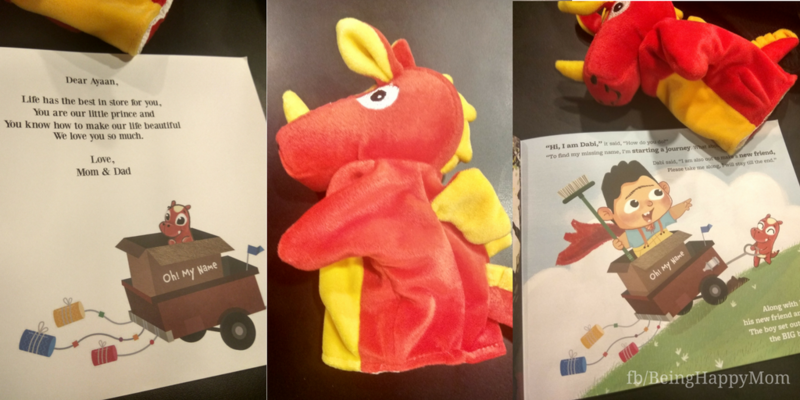 The book comes with a complimentary hand puppet named “DABI”, your child’s companion during storytime and bedtime. The story and graphics in the book will be related to the gender of your baby. Last but not the least, one thing which I personally liked about this book is that 5% of the total profits will go towards making underprivileged children’s lives better. I missed that this personalized storybook should have the photo of a child to make it more personalized. When I shared my feedback with the author then he updated me that they have recently added this feature. So, you can add your child’s photograph along with the personalized message on the first page of the book. Yes, I would personally like to gift this book to children between 2 to 8 years of age. This book is the best way to give a personalized gift to a child. Everybody likes to keep stuff in which they feel recognized and personalized… same with this book. I am sure that my child is going to keep this book in his collection for long, long time. All opinions are based on my personal experience with this book and are not influenced by the company, author or any brand.